Health worker in Scotland tests positive for Ebola. 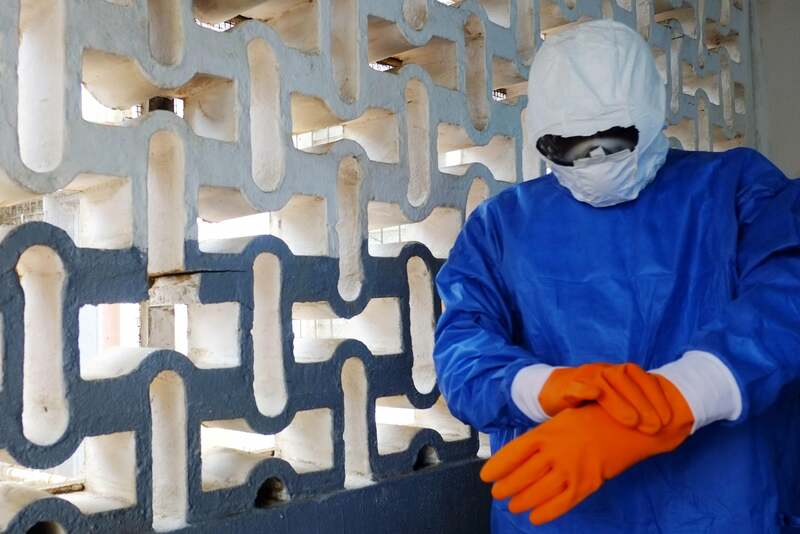 A medical worker in Monrovia, Liberia wears a protective suit before going to the high-risk area of a hospital. A female health worker who recently returned to Scotland from West Africa tested positive for Ebola, the Scottish government announced on Monday. The patient, who arrived in Glasgow late Sunday evening, felt sick and was admitted to a local hospital on Monday morning, before being put in isolation at 7:50 a.m.
“[The patient] returned to Scotland from Sierra Leone late [Monday] night via Casablanca and London Heathrow, arriving into Glasgow Airport on a British Airways flight at around 11.30 p.m.,” the Scottish government said in a statement. Scotland’s First Minister Nicola Sturgeon said at a news conference that “the patient was thought to have had contact with only one other person since arriving in the city, but that all passengers on the flights the woman took will be traced,” according to the BBC. The new case in Scotland comes as the World Health Organization released findings showing the number of people infected with Ebola worldwide has now topped 20,000 with more than 7,800 fatalities. Liberia, the epicenter of this year’s outbreak, also announced Monday a new wave of cases on its border with Sierra Leone.